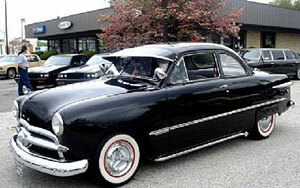 1949 FORD CLUB COUPE !!! 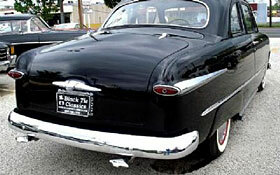 SUNVISOR STEEL Here is the OH SO SOUGHT AFTER 1949 Ford CLUB COUPE ....... The ONE with that PERFECT ROOFLINE and the smaller back windows ..... THE ONE TO HAVE BACK IN THE DAY ...!!!!! WE tried to purchase this car for YEARS and it just WAS NOT for sale ...... The owner passed away and his wife has agreed to part with it .... NOW..... 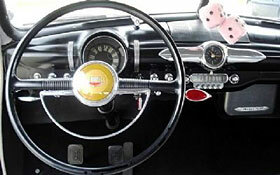 The Car...... DEEP BLACK paint with the silver interior .... wouldn't we ALL have given our right arm for one of THESE back in the day !!!! A SWEET running FLATHEAD rumbling thru the twin pipes and glass packs..... you heard the expression " NOTHING sounds like a FLATHEAD " ??? Well... HERE SHE IS !!!! BEAUTIFUL Chrome and stainless on this baby .... 3 speed with OVERDRIVE TOO !!! This car has had SONGS written about her !!! Words and pictures DO NOT do this car justice ..... And she has the COOL PERIOD touches too Sunvisor, Spotlights, Peep Mirrors, Sidepipes, Skirts, The clamshell DUAL EXHAUST tips and Wide Whites !! !